Demesi Primary School is a very old school that started in 1930. It has grown slowly and steadily over the years to currently have a student population of 391. These students have a huge campus; their playing field is so big that the Mbale rugby team comes to practice in the evenings and on the weekends.The subjects taught here are English, mathematics, Kiswahili, social studies, religious studies, science, environmental activities, hygiene and nutrition, and literature.Children who attend Demesi Primary report to school by 7 am with water in their small yellow containers. They spend 30 minutes to sweep and clean up litter before morning announcements. Normal lessons begin at 8 am and last up to lunch time. Lunch is eaten at the school, an idea that birthed by the headteacher after he realized that some students don’t get fed when they’re sent home for lunch. 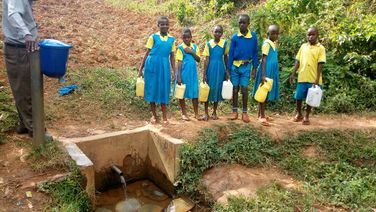 Afternoon lessons go from 2 pm until 4 pm when they take 30 minutes for recess.But this normal schedule is often interrupted because students are removed from class and sent to fetch water from a community spring anytime the water they carried in the morning runs out. Clean Water, New Toilets, New Hand-washing stations and Hygiene Training. Gidagadi Secondary School just opened three years ago in the end of 2014. It opened for the same reason many secondary schools do; students from the primary school needed a place to continue their education. 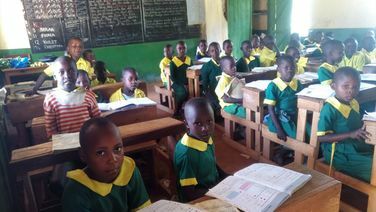 It currently has an enrollment of 90 students who are taught by five teachers. The school also employs two support staff.Students arrive as early as 6:30am to clean their classrooms and pick up the school grounds. Study hall begins at 7:30am and is followed by normal classes before lunch. The school cook prepare a mixture of beans and maize so that students don’t have to walk all the way back home.There are afternoon classes and then an hour of sports and games until students are released at 5pm. 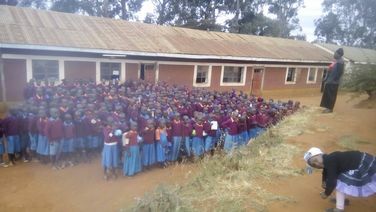 Ikoli Primary School was established in 2013 by the county. Enrollment that first year was 46 pupils across four grades. It has since grown into a full school from grades one to eight. Early Childhood Development classes are also held in the adjacent church building. Now, there are 559 students taught by 14 teachers. There isn’t much more room to grow on the school’s one-acre plot of land. The teachers do not have a staff room, and so they sit on the verandah of the classroom building.Ikoli is a peaceful village with lots of trees, located about one hour away from our office.Students start arriving from 6:30am to 8, immediately starting on cleaning the compound, sweeping classrooms and doing homework. Normal learning begins at 8:20am and go until lunch at 12:40pm. Classes begin back up at 2pm. Students have this long lunch window because most have to return home to find something to eat. There are games and club meetings at 3:10 before students are dismissed. 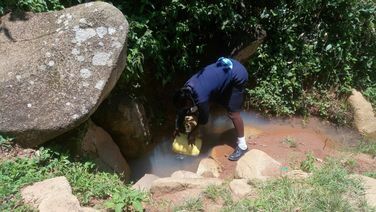 Some students are always scheduled to go out and draw water from a spring and bring it back to school for storage. This water is stored overnight and used the following day. Kathungu Primary is a public day and boarding School which if found in Makueni County of the Republic of Kenya. This school was started in 1974 with grass thatched classrooms. Today there are 247 boys and 242 girls. 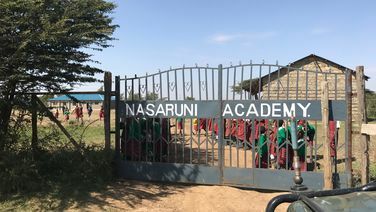 The school has 10 streams which are managed by the 16 teachers with leadership from Mr. Richard Musau the head teacher and his deputy Mr. Wambua Mutisya. The school performs very well both academically and in sports. 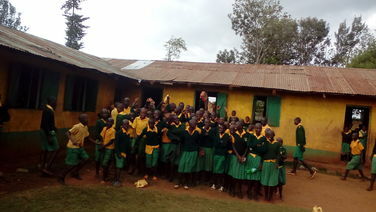 Lugango Primary School is located in Shamakhanga Village of Kakamega County, Kenya. It currently has a student enrollment of 510. It employs 15 teachers and three support staff. The headteacher and oldest students arrive much earlier than the rest, by 6am every morning. They attend a study hall together that’s meant to prepare them for final exams. Students then work together to complete assigned chores like sweeping and picking up litter. Normal classes stretch throughout the day with an hour’s lunch in the middle. Games are played in the evening before dismissal.Most of the students attending here either don’t have adults in their homes, or their grandparents are the breadwinners. This forces many of the students, especially boys, to hunt through the local vegetation to find common herbs to sell and make a living for themselves during market days. 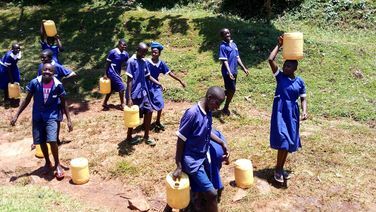 Clean Water, New Toilets, New Hand-washing Stations and Hygiene Training. Madegwa Primary School began in 1939. It currently has a student population of 434, comprised of 214 boys and 220 girls. They are taught by 14 teachers and supported by three other staff.Students begin arriving at 7am to sweep their classrooms and pick up litter around school grounds. Normal classes begin at 8:20 and go until lunch, when the majority of students are sent home to find food. Class eight students remain to be served lunch by the school cook. Classes begin again at 2pm and go until 3:10pm when sports and clubs start up. Whether it’s football, poetry, or debate, students are asked to participate in an interest until study hall at 4pm. Students are released for the day at 5pm. 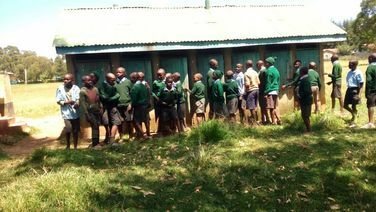 Mutua Primary School is located in the western part of Kenya in Trans-nzoia County in Mutua Village about 30 km from the town of Kitale. The school has a population of 800 pupils of which 300 are girls.